Medical imaging (X-ray, MRI, ultrasounds, etc.) is used to create visual representations of the interior of the body for clinical analysis and medical intervention of complex diseases in a short period of time. The medical imaging market is poised to grow significantly over the next five years as medical providers continue to seek innovative ways to enhance patient care — it was worth as much as $24.39 billion in 2012 and is predicted to grow to $35.35 billion by 2019. Traditional medical imaging systems provide 2D visual representations of human organs while more advanced digital medical imaging systems (e.g. X-ray CT) can create both 2D and in many cases 3D images of human organs. Systems capable of 3D digital medical imaging are currently only a small part of the overall medical imaging market — projected to hit $2.9 billion by 2020 — but it has effectively doubled in size over the last two years and is already rapidly expanding into practice areas such as oncology, orthopedics, obstetrics/gynecology, cardiology, and dentistry. Displays are an integral part of these digital medical imaging systems. Current systems are being provided with displays that can only visually represent the imaging data collected in 2D or at best in simulated 3D on 2D. As advances continue to be made in 3D displays, including glasses-free 3D volumetric displays, the potential applications are endless. Some key verticals within medicine that can benefit from 3D imaging are outlined below. A typical CT scan or MRI produces hundreds of images at one time that then need to be reviewed. It is time consuming to ensure all angles and images are accounted for, not only for the patient but also for radiologists and referring doctors, who need to look at every single cross-section image before deciding on a course of treatment. By utilizing 3D technology within medical imaging, you’re able to take those cross-section slices and combined them into a concise 3D visual of the area being scanned. The 3D data is viewable without any additional viewing aids (glasses-free), in true 3D. This reduces eye fatigue of the viewers and increases cognitive awareness. Certain 3D display technologies currently under development can display these images with resolutions as high as 80,000 voxels (volumetric pixels), a factor of 10x higher resolution than commercially available 2D displays. An example would be a collaborative evaluation of an MRI, CT, or ultrasonic image to determine the presence of an anomaly that otherwise would be obscured when viewed on conventional 2D or simulated 3D on 2D display — like looking for a tumor in dense breast tissue. Benefits include improved diagnostic confidence from patients, the replacement of more invasive diagnostic procedures, and an easy-to-read solution for patient education. In theory, it’s probably easy to assume that we’re “all the same” on the inside, but it’s hard to guarantee what you’ll find until you open someone up. So imagine if a surgeon had a complete understanding of a patient’s actual anatomy before stepping into the operating room. Currently, surgeons have to “mentally solve” a patient’s problem based on what they know about their anatomy from 2D images. With 3D imaging, a surgeon can see a true picture of the anatomy and interact with it in any way they choose, allowing them to solve the issue at hand before picking up a scalpel. Utilizing this process minimizes exploratory surgeries and procedures, and also decreases damage to surround healthy tissues by more exactly pinpointing the treatment area. Being able to view a comprehensive 3D image of the area before surgery limits surprises in the operating room and also increases efficiency of treatment. It is very difficult to maintain all areas of medical expertise on a single location, whether for research or medical treatment. 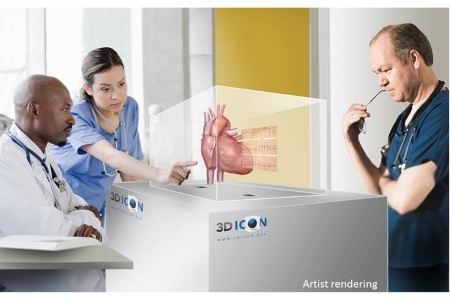 3D imaging creates an innovative opportunity to more accurately represent medical data in 3D than traditional imaging technologies, which can then be viewed simultaneously from different locations around the world. Consider the implications for battlefield medicine, disaster response, or emergency medical care, where appropriate medical attention is needed within minutes in order to save lives. A 3D display would allow medical experts from anywhere in the world to review and assess various injuries in order to recommend treatment performed by responders on-scene. This also limits the need to transport patients to different facilities to be examined by specialists, because a true, 3D visualization of the treatment area is available in seconds, allowing diagnosis from anywhere. 3D printing is an ideal partner for 3D medical imaging because of the uniqueness of every patient and the challenges this creates in sustainable business models that require selling large volumes of similar products. One example is prosthetics, while another is neonatal-specific devices for short-term care. One near-term application is the printing of physical models from 3D data that can be used for planning critical surgeries or general training. In both cases, the primary challenge with 3D printing continues to be speed. It can take hours, or even days, to create a printed model from actual 3D medical imaging data, and if 3D medical imaging data is not readily available, additional time to create the image through various modeling tools is needed. Any additional iterations of the printed part just continue to extend this time. In the case of planning or training, a 3D display would displace or compliment the need for a physical model because the image created maintains many of the benefits of the physical model, but it is now created in seconds versus hours, with additional iterations at a similar speed. The benefit of speed is significant, as the medical user may require information much faster than a printer might allow, even when the 3D imaging data is available in real time. Medicine is one of the most rapidly changing industries in the world as innovation and technological advancements come to light every day, and 3D medical imaging is no different. The technology is poised to change how we diagnose and treat a plethora of medical scenarios — where a picture is worth a thousand words, a 3D image could save a life.